Like half of all Americans, I live less than five miles from where I work. So, no excuses during National Bike to Work Week — except for Thursday, when I have to dress up for a volunteer recognition lunch and attend a fancier work function in the evening. 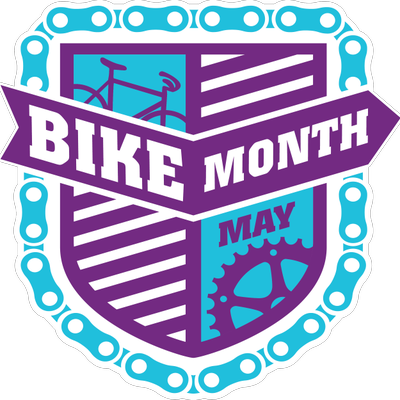 Exercise-challenge programs such as National Bike to Work Day on May 15 or Run 2,015 in 2015 (whoops, too late now!) are effective motivators — except when they’re inconvenient. I learned that the hard way during the 30 Days of Biking challenge in April. On the face of it, my mere seven days of biking during the cold, rainy month were a failure compared with the hard-cores who rode their bicycles to bakeries and tweeted throughout the month or posted grinning, thumbs-up photos on Instagram. What I did instead is what I do every day, every month, every year: I exercised. The particular daily movement that I chose — biking, running, fitness yoga, walking — depended on the weather, on my schedule or on my mood. The #30daysofbiking challenge did inspire me to log the experience. I kept a daily record of my exercise, and that’s proven to be fruitful now that warm weather is here and I really want to up my cycling miles and train to run another half-marathon. My daily logs are both instructive and inspiring. I note the excuses, but I see also that I managed to move every day. The journal entries reinforce my midlife exercise mantra: Something is better than nothing. Any exercise counts. EXCUSES ARE EASY to come by. It’s harder to sidestep #30DaysofExercise, however, than daily cycling because it allows you to be more a generalist than a specialist. On April days when it was too windy and cold to bike, I could easily walk the 1.2 miles to work. Likewise, on a day after my running partner had pushed me to run farther than I would have on my own, I could stretch my aching quadriceps and hamstrings in a yoga class. But the exercise log’s purpose was to record, specifically, whether I had biked. And it revealed more than anything why I failed to get my seat on the saddle for 23 of the month’s 30 days. April 1: Blew it on the first day of the bike challenge! Warm but really windy and then had horrendous rainstorm this evening. Oh, well. April 9: Pouring rain today, 40 degrees. Going to Core Power at noon. April 17: Went for a run with Lou Anne. No energy for more exercise today. April 21: It snowed today. Enough said. 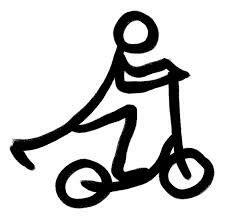 WITH MY LONG LEGS and short trunk, I seem built to ride a bike. It’s an effortless exercise. And so it’s easy for me to combine biking with errands, which feels more healthful — and less stressful — than other forms of multitasking. Movement has more meaning, my cycling log has taught me, when there’s purpose behind it. April 12: Rode to Rainbow Chinese and back to meet friends. As we get more serious about becoming a one-vehicle family, it will become essential to bike. April 16: Still not feeling well so working from home. But I felt well enough to bike to work for meetings. Nobody seemed to mind that I was wearing spandex bike shorts, with bad hair and carrying a helmet. April 26: Rode around the neighborhood and then went to Mom’s. I like combining biking with appointments. It’s a twofer, the equivalent of walking to work. CYCLING MAKES ME SMILE in a way that running never has. I love the sweep of scenery, the sense of being one with the natural world. “You can’t buy happiness, but you can buy a bike,” I read on a cyclist’s T-shirt one sunny Sunday when I was biking home on Midtown Greenway. April 4: Wore my runner’s mask to bike this morning. Legs and fingers froze. No wind, gliding through the streets. Hills felt good after sculpt class yesterday. April 14: Woke up with sore throat and sniffles. Hunkered down and got tasks done at my desk. Rode the six-mile loop along the River Road after work: 60 degrees, sunny, little wind. I felt better afterward. April 28: Thirty-minute ride at 7 p.m. through the neighborhood. Not enough but it was something. 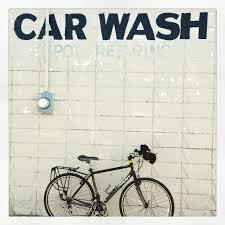 Like any exercise or art or behavior at which I want to get better, biking has to be a practice. This entry was posted in Health and wellness and tagged 30 Days of Biking, bike commuters, cycling, exercise, Yoga on May 11, 2015 by Amy Gage.